Part of the Penguin Orange Collection, a limited-run series of twelve influential and beloved American classics in a bold series design offering a modern take on the iconic Penguin paperback Winner of the 2016 AIGA + Design Observer 50 Books 50 Covers competition For the seventieth anniversary of Penguin Classics, the Penguin Orange Collection celebrates the heritage of Penguin's iconic book design with twelve influential American literary classics representing the breadth and diversity of the Penguin Classics library. 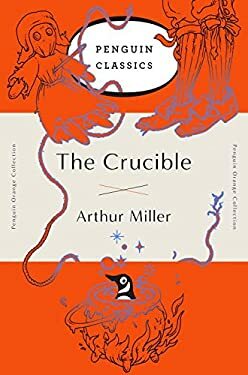 These collectible editions are dressed in the iconic orange and white tri-band cover design, first created in 1935, while french flaps, high-quality paper, and striking cover illustrations provide the cutting-edge design treatment that is the signature of Penguin Classics Deluxe Editions today. The Crucible One of the true masterpieces of twentieth-century American theater, The Crucible brilliantly explores the threshold between individual guilt and mass hysteria, personal spite and collective evil. It is a play that is not only relentlessly suspenseful and vastly moving, but that compels readers to fathom their hearts and consciences in ways that only the greatest theatre can.